The famous D650HP by Damascus Gloves is reborn... and tougher than ever. These leather motorcycle gauntlet gloves are crafted from tactile .45mm ultra-thin Pittards Cabretta Leather for maximum dexterity and a flawless grip, combining sleek looks with unmatched performance. 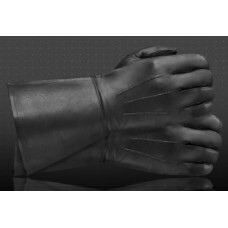 Tough Glove starts with their bestselling, skintight TD302 patrol glove and add a 5 1/2-inch double-layered gauntlet. The result is a snug, flexible fit in the hands and fingers, and a gauntlet cuff that is wide and sturdy enough to fit over a shirt or jacket for maximum protection on the road. IF ORDERED WITH A BOOT PURCHASE, THERE IS NO ADDITIONAL SHIPPING CHARGE. THANK YOU.